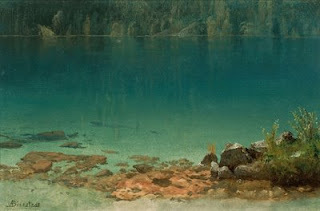 The still lake looks so inviting in this painting. I love the contrast between the clear shallow water in the foreground and the implied depth of the dark blue water in the distance. We might be having a cookout this week at the studio. And if we get a few more warm days, we'll have perfect swimming weather.